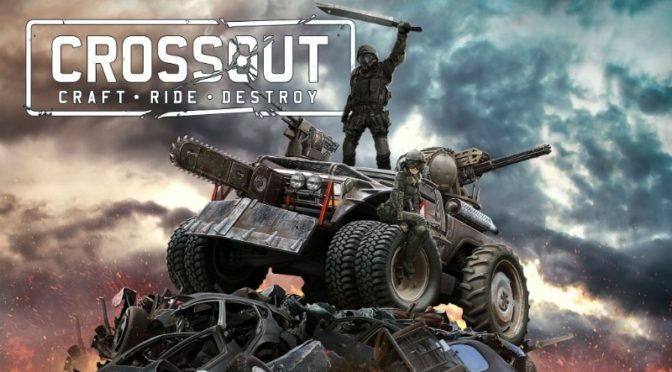 Now in open-Beta, Crossout has amassed more than three million players in game. It’s of no surprise because after spending hours with Crossout, I see the appeal for this type of game. 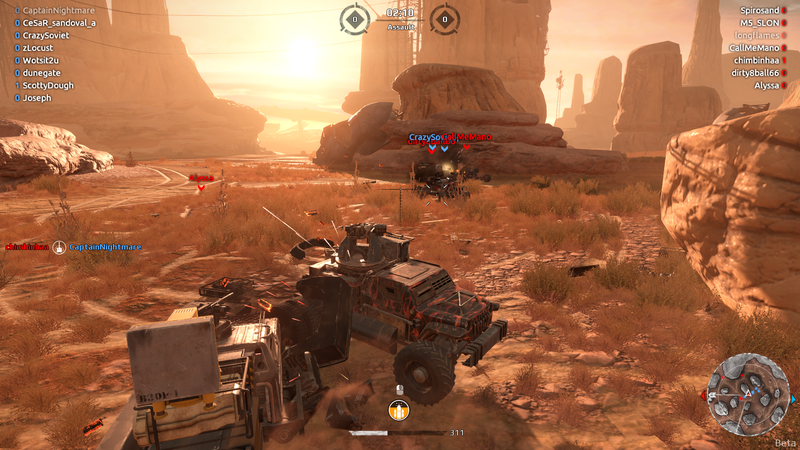 Also it is a post-apocalyptic road warrior MMOG where you get to construct Mad Max style vehicles to battle against other players in destructive missions. In these missions you gain loot and rewards to create even more awesome fighting machines. My road warrior vehicle and a look at the garage. Today in game I see some of the most ingenious and creative machines. 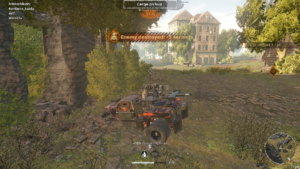 A great part of the game is players can save their vehicles as blueprints to be used by other players. In the garage, once you finalize a build it can be saved as a blueprint and published. When a player acquires all the necessary parts needed they can load the build and use it in game. You will also need enough energy to place weapons. 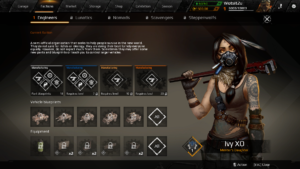 Players can also acquire blueprints for better builds by leveling up in a faction. The best part is you can further customize a blueprint to your style. Of all the things in game the best part is building your own unique road warrior machine. To do that you need to battle. 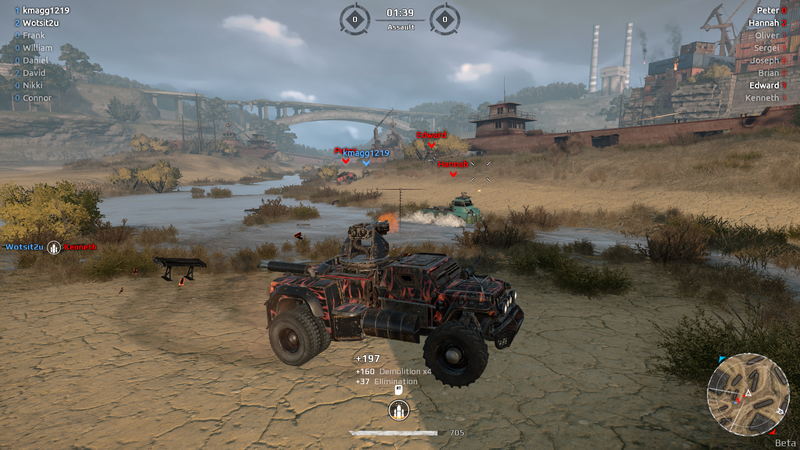 Crossout is all about destructive battles and having fun. 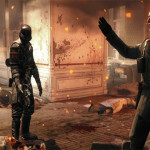 The premise of the game is to battle as a team or individual against other players or the AI for loot and rewards. In addition you also gain points and currency. These points go to leveling up your reputation in a faction. Each faction has different vehicle and part blueprints that are specific for the type of characters involved in a faction. 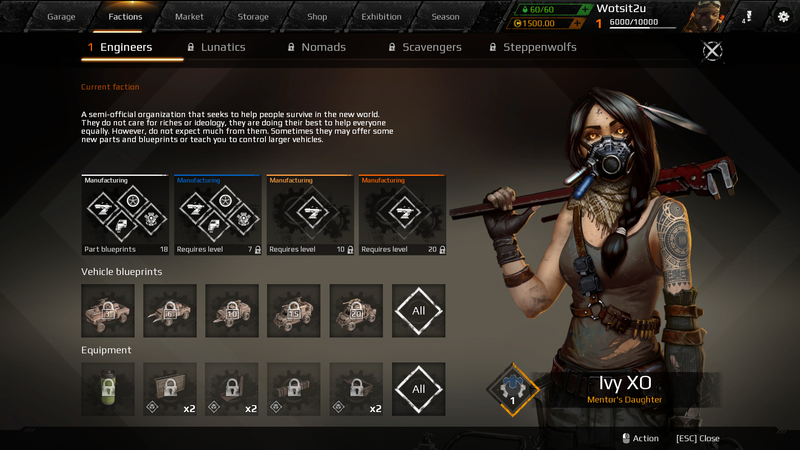 Engineers, the starting faction, have basic vehicles, while Nomads have hybrid designs with airplane and vintage car parts. The Lunatics intimidate so their vehicles are covered with skulls and spikes. Changing factions requires reputation with the Engineers. Remember everything is customizable and any faction vehicle you acquire can be made into your own personal fighting machine. It’s all about customizing the best fighting vehicle in Crossout. Here is a look at a parts list in the garage. There are two places players are going to spend their time, one is in the garage and the other on the battlefield. Let’s first look at the garage. Crossout is meant to be a building and crafting game for road warrior vehicles. 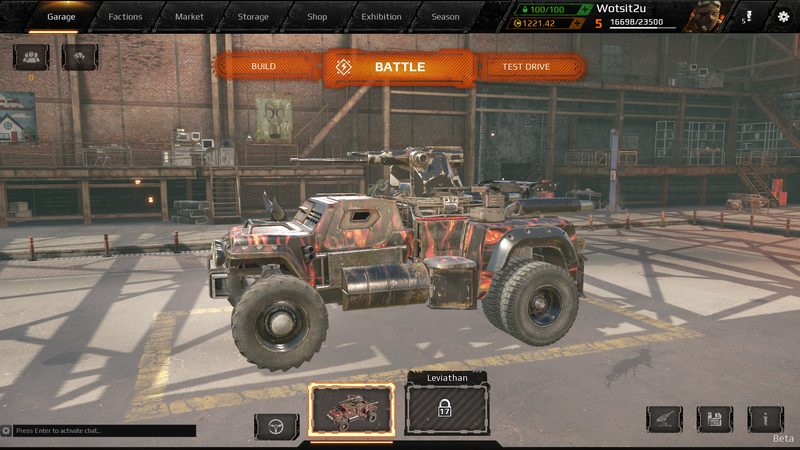 When it comes to building and crafting this game gives players many options to personalize their vehicles. We also get a system that allows players to easily remove parts and add new parts. The game guides players to where parts can be placed in the build mode. 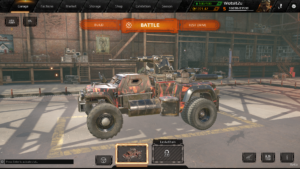 In order to customize, players have choices between vehicle parts like chassis, cabs, and wheels but also weapons, which are needed for battle. In addition, players also have a range of add-ons that are solely for aesthetic purposes like accessories and paint. There are also add-ons that can aid in missions like radar to spot enemies or radiators to lessen the cool down for weapons. We also can get drones to take out enemies. Some types of weapons that are available are cannons, machine guns, and shot guns. Players start out in the Engineers factions but once they reach a certain level get choices of faction. In game, there are several different ways of acquiring parts and weapons. While in the garage players can access the market where you can bid on and buy items. 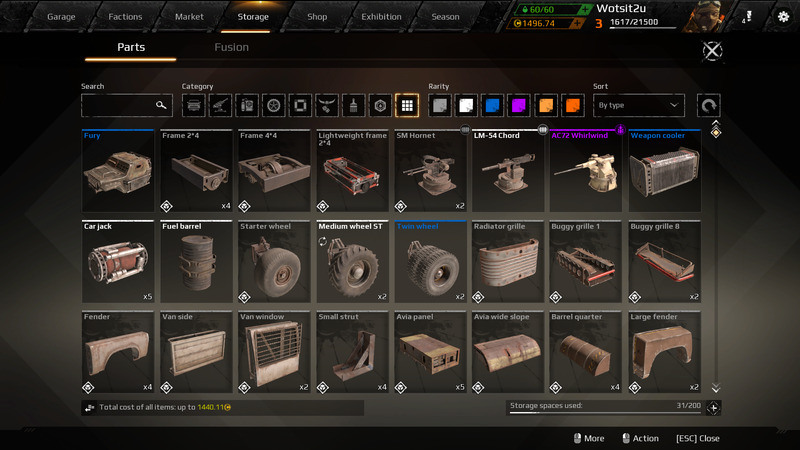 Once an item is purchased you must wait for the transaction to go through and the item moved to your inventory.By doing missions or selling parts like scrap metal, extra weapons, and vehicle parts players earn currency for the market. A store is available for purchases of packs and more in-game currency using real money. 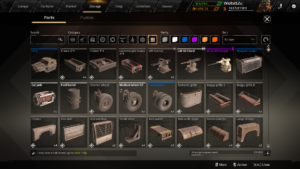 With metal, parts, and the necessary blueprint new vehicle parts and weapons can be crafted. Special missions to obtain parts for specific blueprints are available such as “Get the Machine Gun.” Here a player battles for rewarded parts or the machine gun itself. Raids are also available for gaining loot. When getting a part it will have a rarity type. The rarities are common, rare, epic, legendary, and relic. Better the rarity the better the part. 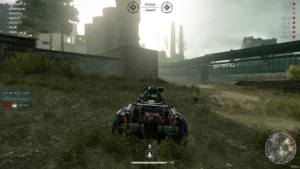 Back in the garage players can also upgrade their faction and skills for the co-driver. A co-driver is a set of skills and abilities within each faction. New skills are added with reputation points. Beyond the vehicle, players can also change their avatars and earn stickers and achievements. 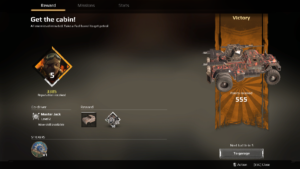 There are also daily challenges that give bonus rewards and seasons with their own unique challenges like playing so many battles, destroying a number of AI vehicles, or using a specific weapon. I always like games that add an extra challenge to just playing the game. Once you have finished with the garage it is time to hit the battlefield and earn those rewards. There are three types of battles a player can choose from; missions, raids, and brawls. Both missions and raids are team battles, while brawls are individual play were you race against other players, free-for-all, or out live a storm. For the missions, players are teamed up and they must capture the other team’s base, fight for the neutral base, or destroy all enemies. Semi-destroyed vehicle in a raid. One of the things I like about this game is that it is about destruction. When you go on the battlefield your vehicle is equipped with weapons but you can also ram other players. As the battle proceeds players’ vehicles are ripped apart and destroyed. That is the point of the game, to survive at all costs and do the greatest amount of damage. Part of the customization is to build a destruction machine. Some weapons and equipment can slow down vehicles making them good for dealing a lot of close damage, but the light and fast vehicles can avoid some of the heavier vehicles for quick attacks. I happened to be the player with a medium to heavy weight vehicle with a very big gun. Cannons do a lot of damage and they tend to blow vehicles apart quicker but have long cool downs. On the note of destruction, once your vehicle is destroyed there is a chance to get a repair kit and return to battle. If there is no repair kit then a player must wait till the end of the battle or go to the garage. Waiting till the battle is over gives rewards. Also because the battles tend to be short it’s not much of a wait. These short battles are quick and more destructive with the team left standing or the first to capture the enemy’s or neutral base claiming victory. Quick, destructive, battles that gain rewards for more destruction. That is why I love this game. After a battle players earn reputation points, rewards, and stickers. 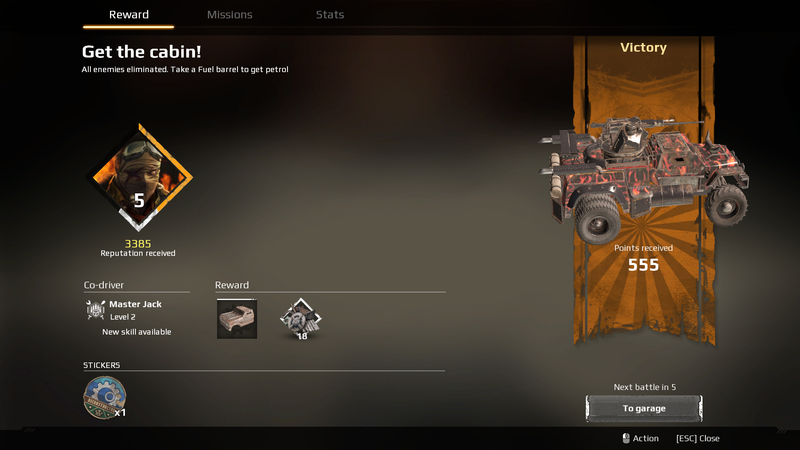 In the rewards you can also see your co-driver skill level. We have the missions and then there are raids. Now raids are longer battles because it is against the AI, defending or looting more than one area, plus the boss. All battles have timers but most of the time they are won before the time expires. For raids your team battles against the AI and your main goal is to defend locations or capture loot. There are also bosses in these battles. 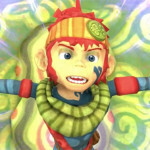 However, before starting any mission, raid, or brawl the required fuel amount and people are needed. Fuel can be bought in the market. Also some battles are unlocked after certain levels, such as free-for-all brawls at reputation level 10. There is a good set of landscapes in this game with a high level of detail. As for the gameplay, driving and battling are only as good as your Internet connection. Lag doesn’t help when trying to destroy enemies and your more then likely to get destroyed as soon as the battle begins. However, I have only experienced this on occasion and most of the time the gameplay is smooth. 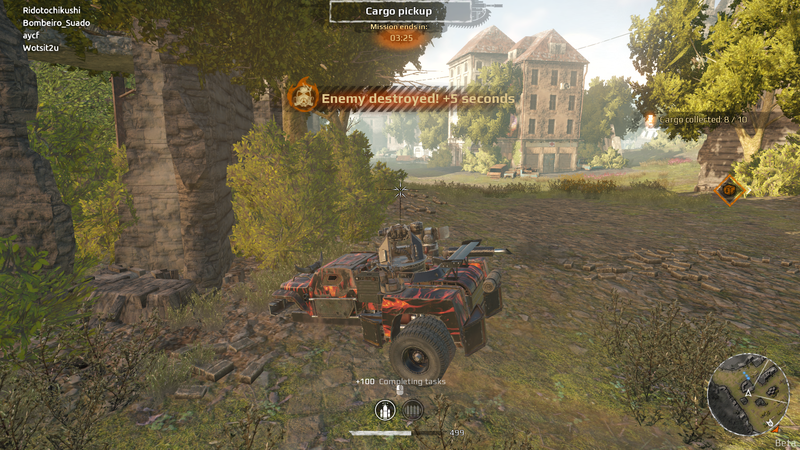 Crossout also has decent driving mechanics and the weapons aim is pretty good. It will take many rounds to destroy an enemy but everyone has a shot. Though it will be harder to compete against higher-level players if just starting out and lack a good vehicle. 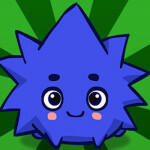 Players are put in teams with all levels and factions but still can destroy enemies and be on the winning team. I did find the game quite balanced to focus on the fun. Even though this game is still in development it is turning into a very fun game of building road warrior vehicles and destruction. It would be nice if we see more rewards in the future with more brawls and raids added. Maps are small but are also a good size for the time limit and style of game. Therefore you spend more time battling and less time getting to the enemy or goal. 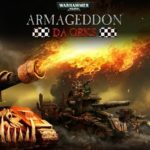 I would really encourage people to check out this game as its so much fun to build vehicles and battle against other players. The models and landscape are very well designed. However, if there is one thing that I am happy about it’s the amount of customization possible to a myriad of vehicles. 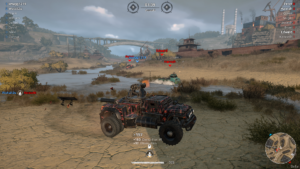 Come and enter the post-apocalyptic world of Crossout and become a road warrior survivor, have fun, and destroy. 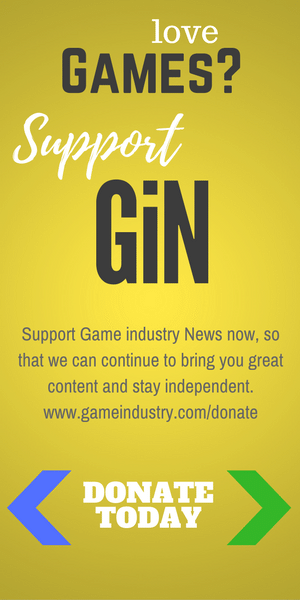 This “game” has inflation made by limiting resources. To upgrade my CoDriver to level 10 I have to give 2000 scrap metal, 1500 wires, 300 copper, and 150 coupons. My limit is about 2800 for scrap and wires and coupons is 0of6 as they say. Some bots say just buy it, what is the problem, Hey dude, I need to sell something first and if Gaijin is limiting everything how can I sell. On top of that I need better weapons and other equipment and it will cost me thousands to get something better, not to mention there is equipment that costs 35000 coins! That is about 350000 scrap metal! And limit is 2800?!!? However you can buy 35000 coins for $400-$500 but so you can buy 10 much better games!! So it is not tough choice, play annoying game or play 10 best!